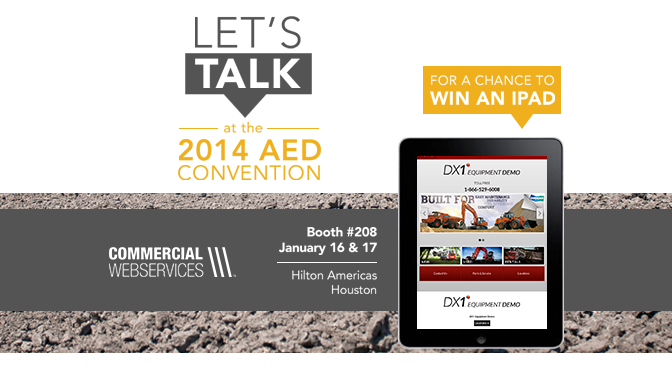 It’s a new year, and what a better way to start off 2014 than a trip to the AED Summit and CONDEX Convention in Houston, Texas! The AED Summit is a great opportunity to for equipment distributors all over the country to come together and learn about new products and opportunities within the industry. AED brings partners and peers together at one venue to enhance business relationships. In addition, many of our partners will be at AED! Industry names including Wacker-Neuson, Takeuchi, Bobcat, Doosan, JLG, Terex, and Atlas Copco are all on the roster. You can check out the entire list of participants here (http://www.aedsummit.com/suites-participants.cfm). Stop by booth #208 for the unveiling of DX1. Set to revolutionize the commercial industry, DX1 will provide the ultimate solution for your business, providing a road map to help seamlessly maintain every aspect of your day to day operations inside the dealership, and online. From marketing to invoicing, DX1 is the turnkey solution that will allow you to focus more on what you do best at the dealership: sell! For more information on DX1 or Commercial Web Services, visit us at booth #208 at AED, or give us a call at 877-858-7973. We can’t wait to show you how we can help your business grow!